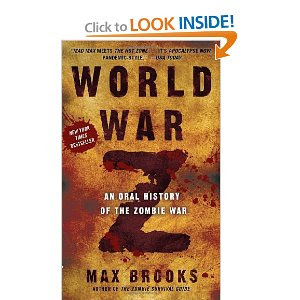 With all the zombie literature, TV, and movies out lately, I had to read World War Z. It's also been made into a movie starring Brad Pitt. Not sure when it will be out in theaters, sometime next year though. It's written as a compilation of interviews with survivors of the great zombie wars, so it feels very real, like reading a soldier's reminiscence of war time. The unabashed words of those who made money off the plague-frightened people, and the high learning curve of trying to fight something that no one had ever had to deal with before really made me feel like I was reading nonfiction. The idea that dogs would continue to be man's best friend into this apocalypse, and how they would be used is a bit heart-wrenching. If you're ready to jump on the Zombie Apocalypse bandwagon, this is as good a place as any to start. There are scary books, and then there are SCARY BOOKS. One Second After is one of the latter. I was weaned on Stephen King books, so there's not much that scares me when it comes to zombies, vampires, werewolves, aliens, etc. Sometimes it's fun to read about "scary" things that are so easy to dismiss as grown up fairy tales. But this is a story that could happen later this afternoon (hopefully not till after I get the carpet vacuumed). An electromagnetic pulse is set off over the US, and most anything electronic just stops; cars, TVs, computers, phones, air conditioning, refrigeration, water and gas pumps, etc. The older cars without computer components in them keep running, but getting gas for them, or finding available parts if one breaks, is a challenge if not impossible. For most people, instead of thinking in terms of how long it takes to drive somewhere, the question now becomes how long it takes to walk there, and how much can one physically carry in the process. Without refrigeration, food spoils, and since no more is being shipped in, people eat the spoiled food and get sick. Clean water may or may not be available. Pharmacies are looted of their supplies, and the drugs that must be refrigerated will have a very short shelf life. Communication with the next town requires that someone walk or drive there to talk face to face; communication with someone beyond that distance is impossible. Those who have guns are able to hunt for food, at first. But as game animals and bullets become more scarce, even that option closes. And then there is the threat of gangs of psychotic wanderers. 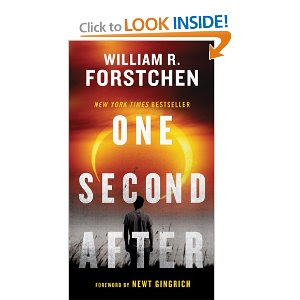 I hesitate to recommend this book, but as "forewarned is forearmed", if you think it sounds like something you'd like to read, please do, and let me know your impressions. I was left with the impression that I should have had a bigger garden this summer, and I should have canned food from it, and I should have snapped up that "grandma's home remedies" book I saw at the store.